Garmat USA Paint Mixing Rooms are designed to provide a well illuminated, clean ventilated work area for mixing applications. These units utilize a positive pressure environment to help eliminate contaminated shop air from interfering with the mixing process. The Garmat USA paint mixing room is a key element when considering your paint shop requirements. We offer several standard models as well as custom models to meet the needs that are specific to your body shop. Garmat USA Paint Mixing Rooms are listed as being in compliance with NFPA 33. Three foot wide rubber sealed personnel doors with heavy duty hardware and 25″ X 35″ observation window constructed of heavy duty clear tempered glass. 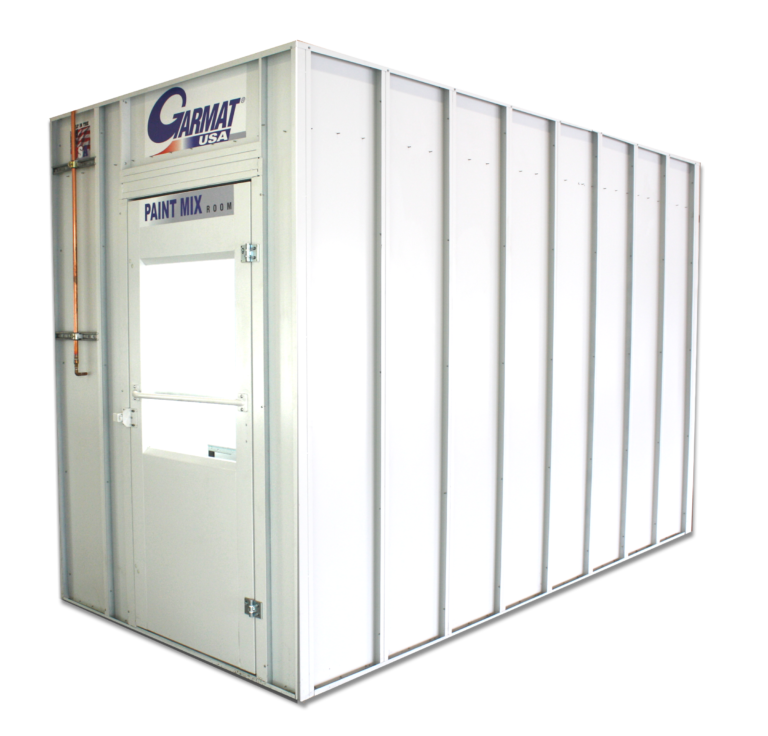 Garmat manufactures Paint Mixing Rooms to fit your particular environment. Our standard models include stand alone, three sided, and transitional paint mixing rooms that fit between paint spray booths. The most common configurations are listed below, all dimensions are exterior measurements. Single Skin models also available. Filter is comprised of superior grade fiberglass media allowing for full depth loading and high dust holding capacity. Performance enhancing skin backing prevents migration of smaller particles. Shop air is drawn into the room with an 800 CFM intake fan and exhausted with a 900 CFM extract fan ensuring fresh air is constantly circulating through the room. When a mix room is within 6′ of a spray booth the combined content cannot exceed 120 gallons total. When the mix room is more than 6′ from the spray booth contents are limited to 2 gallons per square foot up to a limit of 300 gallons. Mix rooms shall be designed to contain a spill of the contents in the room. Mix rooms under NFPA 33 guidelines are limited to a maximum of 150 sq. ft.